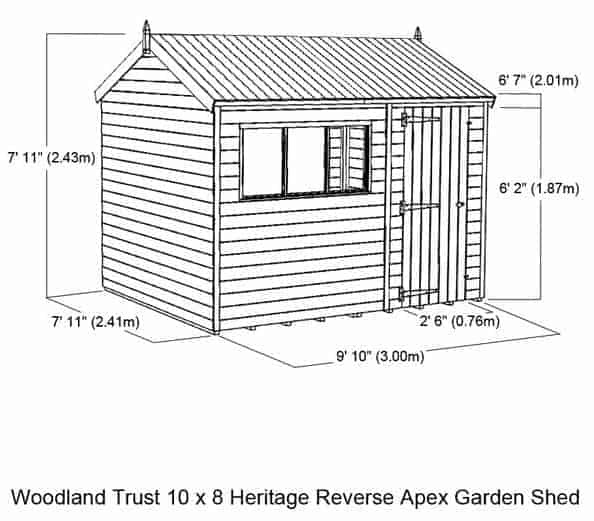 This 10 x 8 reverse apex garden shed is a good size. If you’re thinking of looking for a place where you might be able to store your tools, this is a worthy contender. There is tongue and groove cladding inside the building and outside, and this stuff interlocks firmly to prevent any rainwater entering. A nice apex roof brings extra head height and therefore more value. In addition to this, you also have a building that you can quite easily convert into a home office. So there are bags of potential here. The quality continues with the guarantee that the manufacturers have provided. To give you peace of mind, the manufacturer has stated that you have a 10 year guarantee against rot. The first thing that stands out to us is the beautiful, natural design. The heavy duty mineral felt contrasts beautifully with the unpainted design. We were also pleasantly surprised with the quality of the construction. You can tell that a lot of attention to detail has been put into both the style and practicality of the shed. 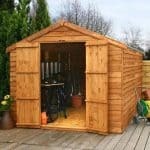 It is one of the larger sheds available and is more than capable of storing large and bulky items. 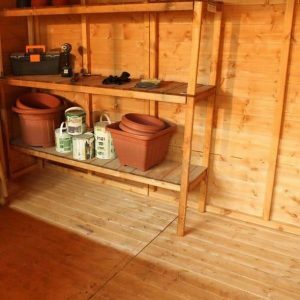 Floor bearers – Helping to keep the floor of the shed off the damp ground, the high quality bearers really lengthen its longevity. They also really help to strengthen the base of the shed. Rim lock – For added security, the shed comes with a rim lock which is located near the door handle. It is opened and locked with an included key. FSC timber – If you care about the environment, you’ll be pleased to know the timber used to build the shed is taken from responsibly managed forests. 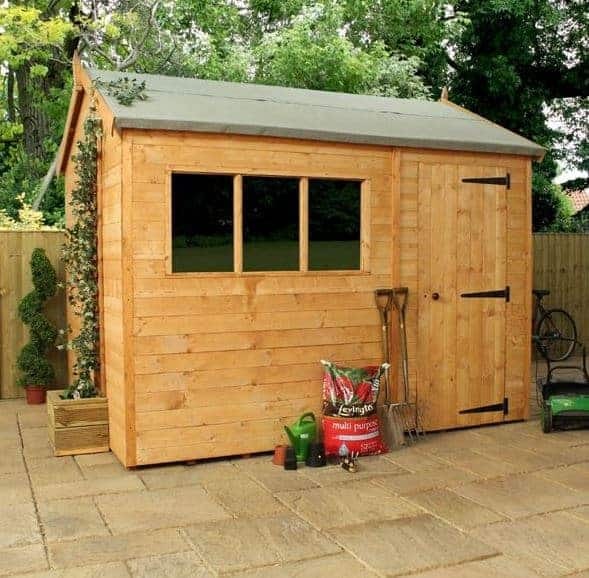 Made in the UK – The shed has been constructed in the UK, helping to support local British manufacturing. Heavy duty felt included – Don’t worry about the rain thanks to this high quality, heavy duty mineral felt. 10 year anti-rot guarantee – No need to worry about the materials rotting over time. The model comes with a 10 year anti-rot guarantee. Woodland Trust Approved – Another environmental benefit, the shed is Woodland Trust Approved. Single glazed windows – The single glazed windows help to keep out harsh winds, while allowing natural light to enter the shed. 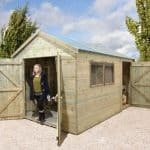 We recommend this as one of the safest shed designs we have come across. The included rim lock is great for ensuring nobody gets in or out without your permission. 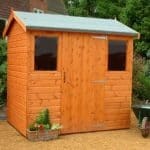 It also has excellent weather protection to ensure rot and damp don’t become a problem for the structure. 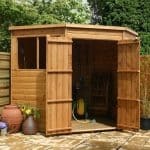 You do need to construct the shed yourself and it will be a heavy and tough job due to its size. It ideally requires a minimum of 2 people to put it together. The good news is the instructions are clear and the assembly itself is easy if you have the manpower. It is more time consuming than anything else. The boards fit perfectly together to leave a flawless finish. 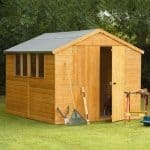 It’s hard to know where to start when mentioning the benefits of this shed. It has a beautiful design, is built to an extremely high standard and provides a massive amount of storage space. One thing we like the most however is the potential to turn this into an outdoor office building. If you invest in the electrical pack, you could soon enjoy a peaceful, picturesque and private place to work. Or it could similarly be used as a workshop. It comes with unique features which give it maximum strength and durability. Then there is also the fact that it comes with environmental benefits. So what about the potential cons? Well the main one is the cost. 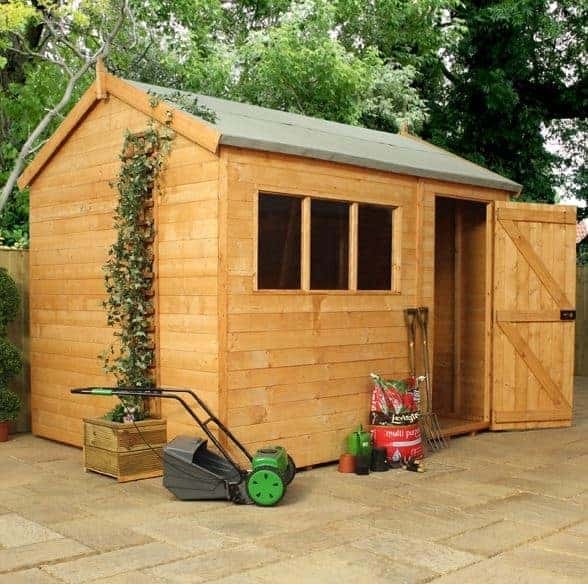 This isn’t exactly a budget shed. However, if you look at it in terms of value for money, it does make an excellent investment. It will last at least 10 years. 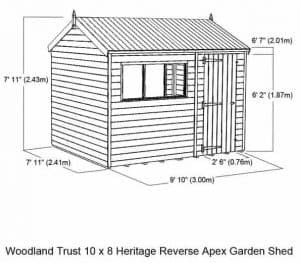 We highly recommend the Woodland Trust 10×8 Heritage shed. 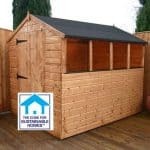 It boasts awesome quality, great features, a really long lifespan and it has the potential to be used as more than a mere garden shed. There is a lot of interior storage and considering its size it is pretty straightforward to construct.